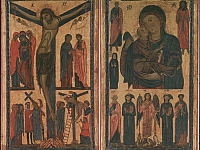 Dedicated to the Tuscan Painters belonging to the 13th and 14th century, Giotto room shows the most ancient paintings to be seen in the Uffizi Gallery. 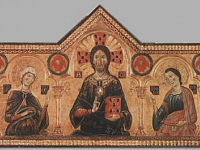 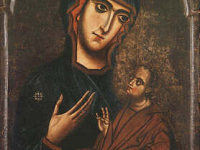 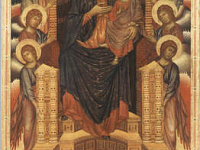 Through the comparison of the three huge altarpieces showing the same subject, a Maestà - the Virgin Mary sitting on a throne with Jesus on her lap, painted by three different artists Duccio di Buoninsegna, Cimabue and Giotto, it is possible to perceive the evolution from the old Gothic and Byzantine style to a more "modern" conception of the space and of the human body. 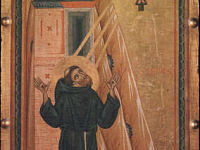 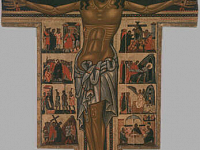 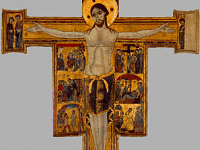 Among other works, the room also displays two painted Crucifixes by two Tuscan Artists whose name is unknown and the Badia Fiorentina Polyptych by Giotto.